Oh hell yes! Duffy’s Tavern is proud to announce a brand new weekly party. 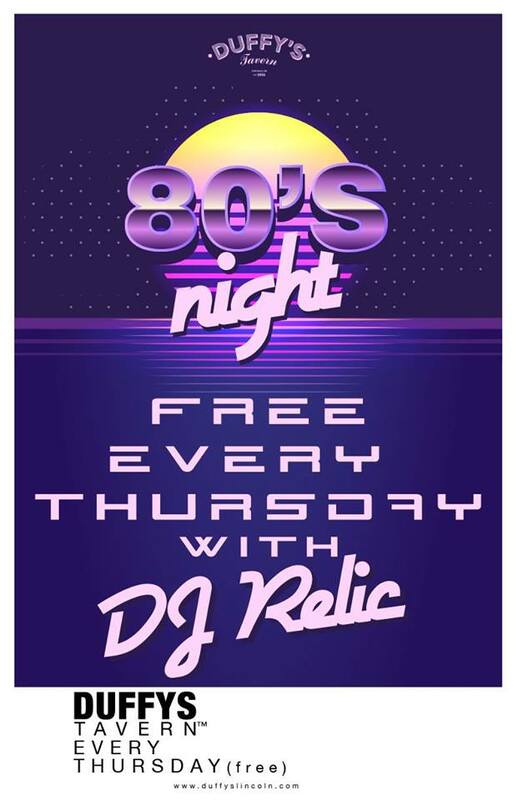 Join the totally rad DJ Relic every Thursday night for 80’s Night. Relic’s got the chops to have you flippin’ and dippin’ some radical moves. Every. Single. Week. It’s been a long time since Downtown Lincoln’s had a worthy 80’s Night, and we know some of you have been getting a little anxious in the absence of one. But take a chill pill. We got you. Whatever you’ve been doing with your Thursday nights, forget all that. We’ll see you here. It’s gonna be totally tubular.